Asti D.O.C.G. Cinzano is the most renowned of all the Cinzano sparkling wines. It is obtained white Moscato grapes the D.O.C.G. area of Asti, in the heart of Piedmont. It has a delicate and and fruity flavour. "Falstaff Magazin" has rated the wine "Cinzano Asti Spumante DOCG, Piedmont, Italy" on 25.03.2014 with 90 of 100 points. 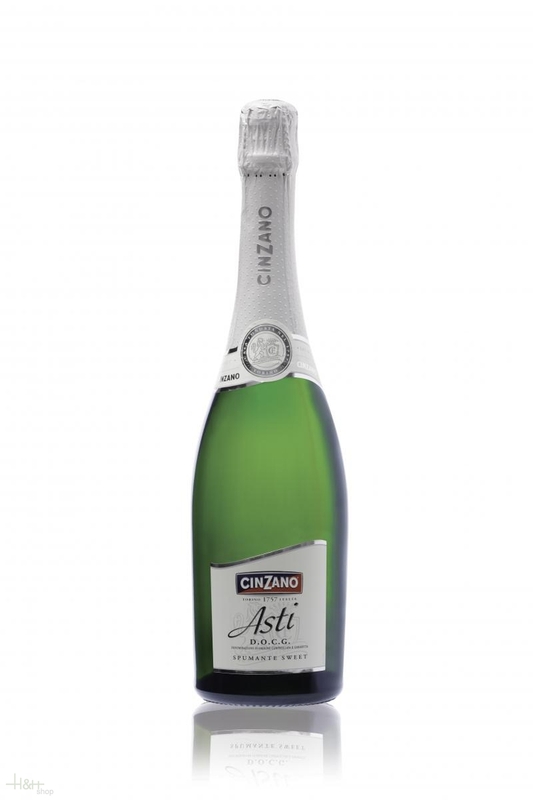 "Wine Enthusiast" has rated the wine "Cinzano Asti Spumante DOCG, Piedmont, Italy" on 05.01.2012 with 85 of 100 points. "Wine Spectator" has rated the wine "Cinzano Asti Spumante DOCG, Piedmont, Italy" on 31.10.1995 with 85 of 100 points. "CellarTracker" has rated the wine "Cinzano Asti Spumante DOCG, Piedmont, Italy" with 83 of 100 points. The fine perlage ensures the persistence of its taste and freshness of the palate combined with its adaptability of being served with a wide range of foods, although it is particularly appreciated served at a temperature of 7/9 C with simple and more creative fish and vegetable hors d'oeuvres, seafood pasta dishes and roast fish or even, as is customary in the area where it is produced, to be drunk throughout the entire meal. This product is obviously elaborated by skilled professioinnel people. The quality is constant whatever is the year. l'Asti Cinzano est, à mon avis, l'un des meilleurs. Il est fait par des professionnels utilisant des installations modernes et sa qualité est toujours la même au fil des années. Ce n'est pas toujours le cas dans une région où beaucoup de vignerons ont des productions artisanales où l'on peut craidre de tomber sur une mauvaise année. Avec l'Asti Cinzano, on est sûr de la qualité. Prosecco Tappo S. Conegliano - 2016 - Sacchetto 19,20 EUR / 25,60 €/lt. Prosecco Superiore Millesimato DOCG 75 cl. - Val D'Oca 13,45 EUR / 17,93 €/lt. Prosecco Motivo Brut - 2017 - 6 x 0,75 lt. - Borgo Molino 136,00 EUR / 30,22 €/lt. Prosecco Superiore DOCG Brut Cuvee del Fondatore Magnum 1,5 lt. - Valdo 25,95 EUR / 17,30 €/lt. Cartizze - 75 cl. - cantina Bortolomiol 25,85 EUR / 34,47 €/lt. Spumante Extra Dry DOC Saia Glera 75 cl. - Marsuret 8,25 EUR / 11,00 €/lt. l'Asti Cinzano est, à mon avis, l'un des meilleurs. Il est f ..